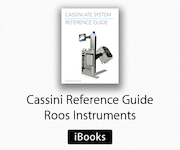 Roos Instruments, the premier supplier of High Speed RF and Microwave ATE systems, has helped industry leaders produce highly complex RF and microwave products. Committed to using green power to protect the environment, Roos Instruments purchases renewable energy for our 100% of our electricity consumption in Santa Clara. "We believe it is important to protect our environment and using green power is a way for our company to act on that belief. Green power is good for our environment and good for our business," commented Catherine Rossi-Roos, COO, Roos Instruments, Inc.
As part of this effort, in 2010 we joined Responsible Business Alliance (formerlly EICC), that to ensure that working conditions in the electronics industry or industries in which electronics is a key component and its supply chains are safe, that workers are treated with respect and dignity, and that business operations are environmentally responsible and conducted ethically. For more information, visit the RBA code of conduct. Employees are trained and engaged directly in regular self-audits relating to topics including energy conservation, reuse and recycle programs, and compliance with all laws, regulations, and contract obligations. 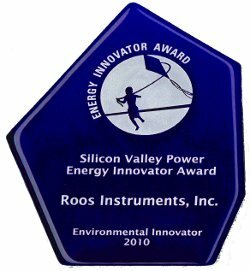 Roos Instruments accepts the "Environmental Innovator" award at at the 2011 Silicon Valley Energy Summit. "The Environmental Innovator award is given for comprehensive efforts to support energy efficiency and renewable energy" according to Silicon Valley Power. RI is honored to be recognized for our "all in" commitment to environmental stewardship of our planet and leadership role the industry's efforts to reduce any negative impact on the environment we create. Roos Instruments, Inc. is proud to purchase 100% Green Power from Silicon Valley Power we hope that our customers and vendors will do the same. We believe it is important to protect our environment and using green power is a way for our company to act on that belief. Green power is good for our environment and good for our business. Compliance reports are available by request. Since 2010, RI has participated in Earth Hour by switching OFF our lights for an hour on March 26th at 8:30pm. If you are our customer, vendor, or partner, please join our partner program (below) and let us know what else you will be doing for the rest of the year to be green. All the companies listed below have a published Corporate Responsibility program. Starting in 2010, our signifigant customers and suppliers are asked to develop a Corporate Responsiblity program. Participating supply chain partners (vendors and customers) should fill out our "Green" Partner Program Sign Up Form to be included in the list below. Please fill out our "Green" Partner Program Sign Up Form to be recognized.